Looking to sell your extra-large dog crate? Or trade Frisbees for tug toys? 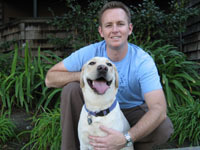 Jason Port is the founder and president of Shammie’s World–the Internet’s premier spot to buy, sell, and trade pet supplies. Best of all, there’s no charge to use this site–membership is free. What or who was the inspiration for Shammie’s World? My Doggy Shammie was the inspiration for the site! Becoming a pet owner really opened my heart and eyes. Why did you think the internet needed such a spot? Shammie was becoming my good friend and I was starting to think we should do or start something to help all animals and pets. Who uses the site – shelters and rescues or is it primarily individuals looking to save a little money? We have a directory list of rescues and shelters which we update every week. We also hope it helps people, shelters, and rescues who don’t have the money to spend in this tough economy. We wanted to provide a free, trusting networking site. You also list adoptable animals on the site. Which rescue groups do you work with and how did you choose them? We have been working with Bideawee Animal Shelter (Bideawee.org) out of New York. Locally we have been working with Santa Clara county animal shelter (southcountypets.com) out of San Martin, California. We have been doing a lot of networking the last two years and really do our research when partnering. What’s next for Shammie’s World? This year we hope to sponsor another cancer dog walk and public service announcements on bay area college radio stations. We look forward to becoming another great outlet for everyone to use and trust.